UNH's PicturePost & the Seacoast Science Center are interested in using Infragram to expand on usage of the Seacoast Science Center (SSC) PicturePost. UNH's Student Climate Data: Vegetation Index Learning Sequence provides a great resource for analyzing digital images. 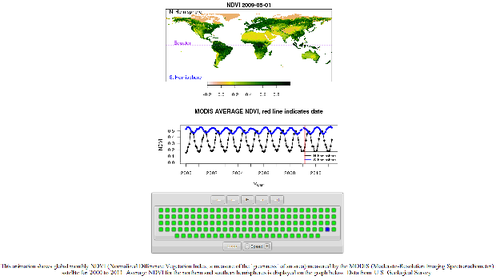 The sequence looks at NDVI changing through the seasons," which exhibits the average MODIS NDVI in the N & S hemispheres. 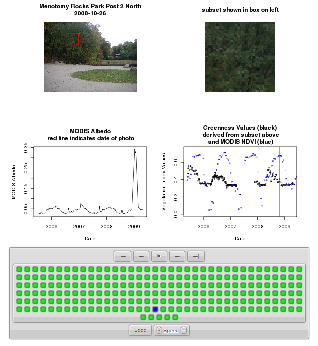 Part 3: Linking PicturePost images to MODIS data is the particular area of interest & asks: "How do Picture Post images compare to corresponding MODIS images, and what potential variables might affect the correlation between these two data sources?" Infragram images can be used to expand on the sequence above & to compare seasonal NDVI. I took some Infragram pics & uploaded them to the SSC PicturePost. The images can be downloaded by anyone & converted to NGB & NDVI through PVOS Infrapix converter. I need to work on using a balance card before taking pics. Improve the workflow: Balance card calibrations, Capture, Upload raw (or Convert, Upload to PicPost) Speak with Annette Schloss, UNH Picture Post, & Rob Royer, Seacoast Science Center, about how they would like to use Infragram. Mention my interest in collecting NGB imagery of the SSC & Odiorne Point State Park at low tide. From what I understand, obtaining accurate NDVI images through Infragram is presently being run through final testing. Some people may already be comparing their images to MODIS NDVI, but it benefits the community to be repeated: Collecting visible imagery & NIR for comparison to MODIS NDVI could provide another estimate for Infragram NDVI. Learn from other monitoring programs, like PhenoCam, & see how Infragram could be used to build more data collection points as a low cost entry for citizen scientists. Holy cow. This is a really great idea. They have MODIS NDVI included in their animation! It would be awesome to get a few people to take infrablue photos at the same Picture Post every two weeks or so for a year or more. It would be important to establish a good protocol (camera, filter, settings, white balance, etc) before the first photos so that it stays the same. The actual NDVI values will not match the MODIS NDVI, but the annual cycle could look just the same. Also, comparing among different Picture Posts done with different cameras, etc. will not be that meaningful, but each NDVI Picture Post series could be very revealing. I wish there was a Picture Post near me. Oh, wait, it's just a piece of plywood.